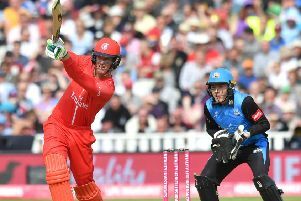 Lancashire captain Liam Livingstone has no qualms about drafting England batsman Keaton Jennings back into their side for today’s Vitality T20 Blast Finals Day. Jennings endured a torrid Test series against India, struggling at the head of the innings and ending the series seemingly low on confidence. The 26-year-old top-scored in Lancashire’s quarter-final against Kent with 46 and will be welcomed back with open arms. “Yes, of course Keats will play,” said Livingstone. “He has been a massive part of our white-ball cricket. “He’s been our rock in the middle order in Twenty20 cricket, won us games and played unbelievably well. “Keats will fit seamlessly back into that middle order. Lancashire will meet Worcestershire in the opening semi-final at Edgbaston (11am) with the winners meeting either Somerset or Sussex in the final, scheduled for 6.45pm. Lancashire’s presence in the last four owes much to their bowlers with their batsmen yet to record a total in excess of 190 this year. Alex Davies, with 525 runs at an average of 58.33, has performed admirably and his load should be lightened by the return of Livingstone from injury as well as the availability of Jennings and England colleague Jos Buttler. Buttler, in particular, could be their trump card after starring in the Indian Premier League this year, hitting a record-equalling five successive half-centuries, and with confidence flowing after a successful international summer. Matt Parkinson has been the leading leg-spinning wicket-taker this season with 23 scalps, while James Faulkner’s array of variations helped the 2015 winners finish third in the North Group before defeating Kent in the last eight. The Lancashire-Worcestershire match will see Buttler face off against another England team-mate, Moeen Ali. He knows he will have no secrets from Buttler, who has kept wicket to his off-spin for years. “I’m not sure I want to bowl at him too much. He’s seen everything I’ve got but it only takes one ball, one mistake,” said Moeen. “He’s an incredible player, and with the way he’s been playing this year, we’re going to have to try and get him out early somehow.